Review date: 8 November 2001. I've reviewed a variety of Lian Li cases, but there are four models now available in Australia that I haven't looked at yet. Don't get too excited about this, though, because these cases aren't anything tremendously new. They're all basically the same as another Lian Li model; the differences are largely cosmetic. If you've been hanging out for a case "just like that one, only black", though, then you might find exactly the enclosure you're looking for here. All of these cases have the usual Lian Li features I've mentioned before. Lots of ventilation. Lots of drive bays. Very nice fit and finish. Everything held together with shiny thumbscrews. 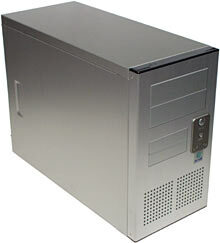 And aluminium construction, for light weight and slightly better cooling. 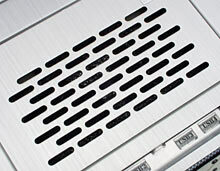 Conduction through the metal doesn't amount to much for PC cooling purposes - virtually all of the heat from your PC's components is blown out of the case by the cooling fans, when you've got a well-ventilated case like a Lian Li. But it doesn't hurt to have an aluminium frame to mount your hard drives in; it'll conduct heat away noticeably better than a steel one. The other feature that all Lian Li cases have is a darned imposing price tag, which gets even more imposing when you realise that the base model cases don't come with a Power Supply Unit (PSU). But these cases are now quite a lot cheaper than they used to be. Well, they are here in Australia, anyway; if you're foolish enough to live somewhere else, tough. The broad range of Lian Li sizes and styles you can get now, combined with the less ludicrous pricing, makes these cases considerably more attractive than they were. This little tacker looks like a shrunk version of the classic PC-60 (which I reviewed rather a while ago here). The PC-30 is basically the same as the black-and-silver PC-31 (which I review here), but with the brushed-aluminium finish of the "silver" Lian Lis. Inside, the PC-30's short-but-deep form factor is obvious. From the front, this case looks like a mini-tower, but it's got room for a full-sized motherboard, two 5.25 inch devices, and six 3.5 inch devices. Both 5.25 inch bays and two of the 3.5 inch bays have front panel cutouts, and the bottom three drive bays sit directly behind the two standard 80mm front intake fans. As with the PC-60 and PC-31, these fans have a three-position speed control switch under the clip-off front panel, so you don't need to have them making a racket if there's just one drive - or none - for them to cool. There's a cleanable dust filter over the fans too, naturally. 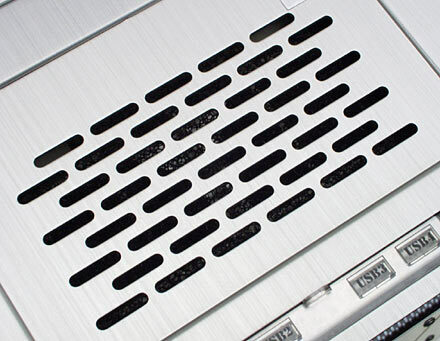 The PC-30 doesn't have a rear exhaust fan, but it does have a slide-out motherboard tray and a plug-in-the-middle case connector cable that makes it easy to slide the mobo out without unplugging all of the little switch and LED wires. And the PC-30 has the PC-60 style, down to the fake-but-looks-real carbon fibre caps on the top and bottom of the front panel. Aus PC Market are shifting the PC-30 without PSU for $AU275 delivered, or with a quality 300 watt AOpen PSU for $379.50 delivered. There are various other PSU options, of course. At this price, this certainly isn't a bargain basement case for the LAN partygoer, but you're getting substance as well as style for your money. If you want an understated little PC that won't bring the Deadly Touch Of Beige to your home decor, or if you want a highly portable computer that you can work on without barking knuckles and cutting yourself (many tiny cases were apparently made in a cheese-grater factory), the PC-30 looks like an excellent option. Check out my PC-31 review for more detail on the layout of this case. Its model number is only one off from the PC-60's, and that's a hint. 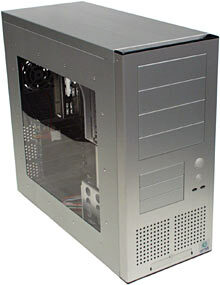 This case has as much in common with the silver Lian Li midi-tower as the PC-31 has with the PC-30. Inside, the PC-60 and the PC-61 are practically the same. The 61 isn't quite like the original PC-60 I reviewed here, but it's functionally identical to the PC-60USB I checked out more recently here. Cosmetically, though, the PC-61's obviously different. Note, for the visually impaired: It's black. The PC-61's black finish isn't paint. It's anodised that way. 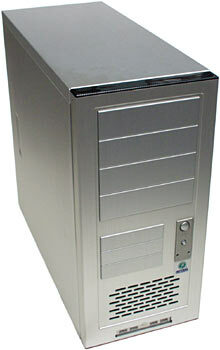 And the case thus retains the brushed finish of the PC-60. This is a rather tasty semi-matte look, if you ask me; if you don't spoil the effect with beige drives, this case will definitely pass muster in the headquarters of an evil genius. Aus PC Market have black-fronted floppy and CD-ROM drives, by the way. If you want anything fancier than that, though, you're going to have to scare up black-fronted drives from elsewhere, or paint or dye other ones, or fiddle about with drive-behind-a-panel mods. The PC-61 power and reset buttons are differently styled from the PC-60 ones, but they're mechanically the same. 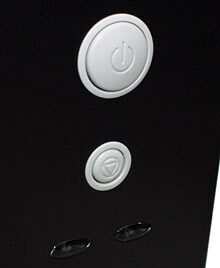 The layout of the front of the case, behind the clip-off front panel, is identical to the silver version. Like the PC-60USB, the PC-61 has four USB ports under a little flip-down door on the front panel. 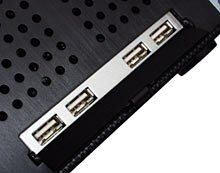 These ports are connected to a couple of standard motherboard USB plugs; there's a good chance that if your motherboard supports extra USB port brackets, you'll be able to connect at least two and possibly all four of the PC-61 ports. If you're looking for a sharply styled black case, the PC-61's got a lot going for it. If you stud it with beige bezels then it ends up looking a lot dorkier than a PC-60 with the same drives, but if you can keep the blackness happening then the PC-61 looks very much, as they say, the business. It costs $AU363 delivered with no PSU (only barely more than the $AU357.50 for the PC-60), or $AU467.50 delivered with an AOpen 300 watt PSU installed. This case is very, very nearly just a PC-60USB with a windowed side panel installed, as reviewed here. The factory-installed acrylic window panel is standard equipment for the PC-65, though, and it's also got the button styling of the PC-61. Plus, there's a five-drive vertical-mount bottom 3.5 inch bay, as seen in the PC-70, which brings the PC-65's drive bay complement up to four 5.25 inch (all external) and eight 3.5 inch, three external. This is a show-off case, so I had to take a picture of it from an unusual angle. I'm sure you understand. Case modders looking for a head start on their next neon-and-glow-wire project will no doubt be pleased to learn that the PC-65, without PSU, costs only $AU390.50 delivered. That's definitely less than the price of a PC-60 plus the $AU99 window panel, and you're not left with a spare side panel you don't need. Apart from the see-though side, the PC-65 is very close to being a PC-60USB, functionally speaking. What I say about that case here goes for the PC-65, too. If you want to build a friend-impressing yet practical PC without stuffing about with a jigsaw or Dremel, the PC-65 could be just what you're looking for. The PC-69 is, once again, functionally equivalent to the PC-60. Front fans with speed control, back fan, motherboard tray, front USB ports, et cetera. The only difference is the styling of the front panel. If you didn't like the minimalist PC-60 look, the slightly fancier PC-69 may tickle you. 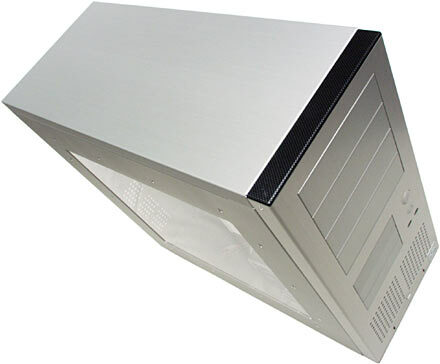 The PC-60-ish cases (including the PC-30 and PC-70) have two square arrays of small holes over their front fans. These grilles let air through pretty well, but are definitely more metal than hole. The PC-69's staggered horizontal slot grille should let through a bit more air. 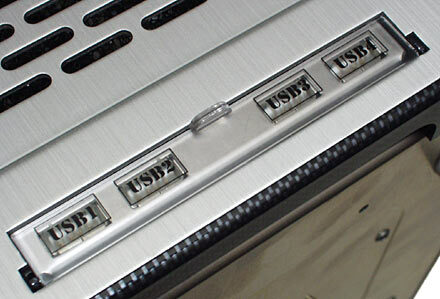 The PC-69 also has this see-through door over the USB ports. And there, pretty much, endeth the differences. But cooling fanatics probably will care about the freer-flowing fan grille. The PC-69 is, for some reason, a bit cheaper than the PC-60USB; it only costs $AU341 delivered, without PSU. That's only a $AU16.50 saving, but it doesn't hurt. 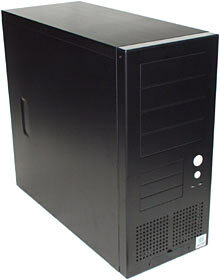 As I said above, Lian Li cases are a lot cheaper now than they used to be. And you can get more models. Mind you, lots of people have noticed the new interesting models and the less painful pricing. As a result, the things are selling like hot cakes. If you're a rugged individualist who Has To Be Different, buying a Lian Li may leave you facing the terrible discovery that a dozen other people at the next big LAN party are wearing the exact same dress as you. Are using the exact same computer case as you. If this concerns you, then you're either going to have to stock up on fancy case modding gear and make your Lian Li obviously all your own, or you're just going to have to hunt around for another zooty-looking case which the masses haven't yet discovered. If it doesn't pain you to buy something that - shock! 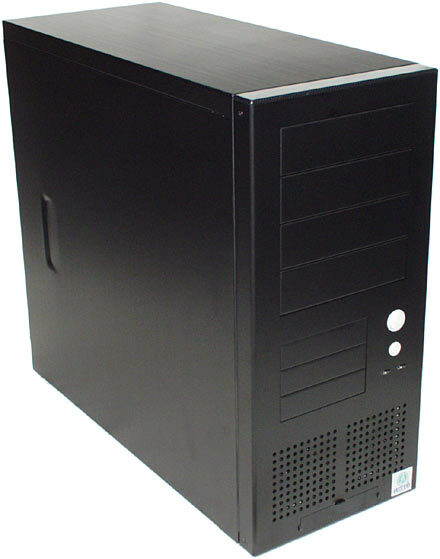 - many other people also buy, then a Lian Li of appropriate dimensions to suit your application is an excellent choice. So many people are buying them because they're good. Light, sturdy, easy to work on, nice looking. And they are, at least, still expensive enough to keep the real riff-raff out. 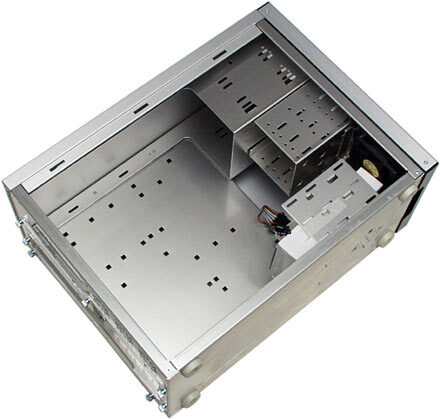 When I need to build a boring little box to work as a print server or something, I don't put it in a Lian Li case. Any old cheapo-box will do for undemanding purposes, especially if you're practically never going to have to work on the computer. A not-too-awful mini-tower case with an undistinguished 250W PSU can be had for less than $AU75 delivered. And even if you want serviceability and a high-grunt PSU, there are much cheaper options than a Lian Li. The AOpen H600A I review here, for instance, is a highly featureful beige steel case that's now selling for only $AU187 delivered with a 300 watt PSU. So Lian Lis still definitely count as a luxury item. But if you're building a powerful PC and you've got the spare money, a Lian Li case is not a purchase you're likely to regret. I'm certainly going to keep buying them.